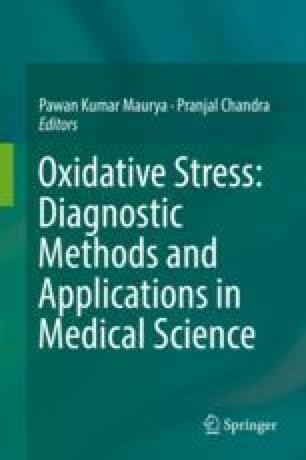 Oxidative stress is the disturbance in the balance between production of free radicals (superoxide anion, hydrogen peroxide, hydroxyl radical, organic hyperoxide, etc.) and antioxidant (catalase, superoxide, dismutase, scavengers, etc.) defense system, which can cause several diseases like Asperger syndrome, myocardial infarctions, Alzheimer’s disease, depressions, Parkinson’s disease, autoimmune diseases (systemic lupus erythematosus, vasculitis, rheumatoid arthritis, etc. ), and even cancer. Several techniques like HPLC, GC-MS, GC, HPLC-ECD, electron spin resonance, etc. have been used to detect the specific biomarkers of the oxidative stress. Several compounds like dichlorofluorescein diacetate (DCFDA), dihydrorhodamine 123 (DHR), luminol, etc. can be used to measure the reactive species in cells. Various methods like fluorescence microplate reader, flow cytometry, confocal microscopy, etc. have been used to measure the oxidative species from the output of the probes. Several biomarkers like alpha 2 HS glycoprotein (AHSG), glial fibrillary acidic protein (GFAP), α-1-β-glycoprotein (A1BG), etc. are highly expressed in the rheumatoid arthritis patients than healthy controls. Several techniques like lipid peroxidation, protein oxidation, superoxide dismutase (SOD) activity, catalase activity (CAT), total antioxidant capacity (TAC) activity, NADPH oxidase activity, etc. can be used to measure the reactive species in the rheumatoid arthritis.